Moms-to-be are breaking the mold in inviting family and friends to gatherings for ultrasound viewing. One pregnancy trend mixes family, friends and high-tech features, reported NBC's Today show earlier this year. Welcome to a new level in pregnancy oversharing: the ultrasound party. Ultrasound service companies are springing up all over the U.S. to help parents-to-be turn a common procedure into a party. "Thanks to improved ultrasound technology, parents-to-be can now invite friends and family to share in an intimate viewing of baby in utero," according to the news segment. Related: Personal Birth Videos: Worth Sharing? The atmosphere can vary — as can prices from the very posh ($350 and up) to basic and no-frills ($100). Moms-to-be, remember that you get what you pay for, depending on the company you use. But basically the event goes like this: "The ultrasound tech squirts gel on [a mom's] belly, the expectant mom looks at the beating heart on the flickering screen, and a dozen friends and family members huddle in for a closer look," the Today show report says. Some facilities project the ultrasound image on a flat-screen TV for your guests to see while sitting on plush couches, usually with complimentary drinks in hand. Guests are optional at the 3D/4D ultrasound facilities, but most of the ultrasound appointments usually turn into gender reveal parties, according to the Today show report. Experts in the Today report cite possible safety issues and motives behind the use of ultrasounds that are not medically necessary. 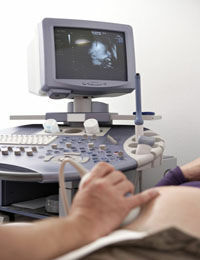 "Since 2008, the FDA has taken an unapproved position on keepsake ultrasound videos and images," the report says. OB-GYNs quoted in the article emphasize that ultrasounds are safe because radiation is not used, pointing out that women with high-risk pregnancies usually receive multiple ultrasounds weekly. Our Ask The Labor Nurse blogger tackled this topic when a reader asked, Do I have to have an ultrasound? She reminds moms-to-be that virtually every pregnancy includes at least one nowadays, but they're not mandatory. Women had healthy babies for thousands of years before technology, digital photography or lab work. "If you don't want an ultrasound, just don't have one. If your doctor makes a stink about it, switch doctors," she recommends. What's your take on the topic? Do you think an ultrasound party sounds like fun or a no-no?